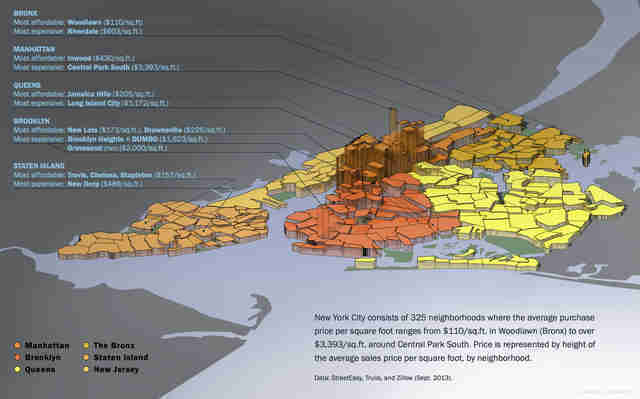 From mapping wizard/NYC real estate developer Constantine Valhouli (who's also responsible for this interactive music map) comes this new 3-D map joint that -- compiling data from StreetEasy, Trulia, and Zillow -- multi-dimensionally plots out the prices per square foot in all of NYC’s 325 neighborhoods. The highest price per square foot? $3,393 on Central Park South (duh). And the lowest? $110 in Woodlawn. 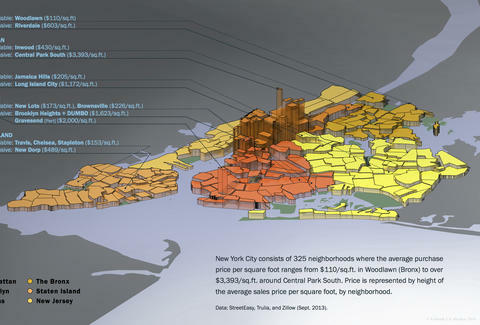 Click here to enlarge the image and see how your 'hood very literally stacks up price-wise. What does the view from a $95MM, 1,396ft-high penthouse in NYC look like?